Diamond Linen Quilting by Home Treasures is a diamond stitch pattern woven onto Provenza a 100% linen fabric that is finished with a solid border. 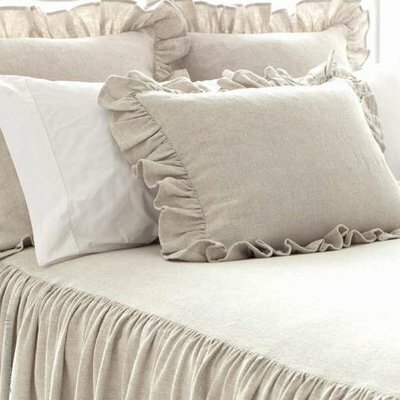 A bed dressed in Diamond Linen is sure to be elegantly stunning. NOTE: Order for shams must be accompanied by the same style and color coverlet. Diamond Linen Quilting by Home Treasures is a diamond stitch pattern woven onto Provenza a 100% linen fabric that is finished with a solid border. A bed dressed in Diamond Linen is sure to be elegantly stunning. 100% Italian linen 4 colors Dye lots may change and are not guaranteed Products are made to order and take approximately 4-5 weeks This is a "custom" collection (please see the DeWoolfson return policy on "custom" items before ordering) NOTE: Order for shams must be accompanied by the same style and color coverlet.